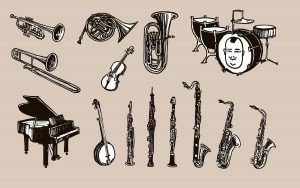 Having an unique style and an impressive musical sound, jazz has a variety of musical instruments which establish the basis upon which the vocal part is being overlaid. In the following paragraphs, information about several of the musical instruments used in jazz will be provided, allowing fans all over the world to understand more about the origins and creation of the intricate sounds comprising any jazz composition. The clarinet: having being developed in the Romantic period, the clarinet was continually redesigned and refined, this allowing it to gain more and more popularity, even in the “arsenal” of composers such as Berlioz or Brahms, eventually finding its way into jazz as well. The double bass: famous string instrument which is significantly larger than a cello and this will require the musician to hold the instrument by its side, in order to have better control of the strings.